This month, I made it a goal to try at least 1 new recipe per week that I've pinned to my sweet recipe Pinterest board. Thankfully I've had wonderful guinea pigs taste testers willing to try my initial attempts and give me feedback in as little words/sounds as "Mmm..." just so I got an idea if the recipe was blog-worthy or if I needed to tweak it. This one got a big "Yum" so I decided to share it! Recipe adapted from Crumbs and Chaos. Makes about 1 dozen donuts. Preheat oven to 325 degrees. Spray a donut pan with cooking spray. In a large bowl, mix flour, sugar, baking powder, nutmeg, cinnamon, and salt. Then add buttermilk, eggs, vanilla, and melted butter until well combined. 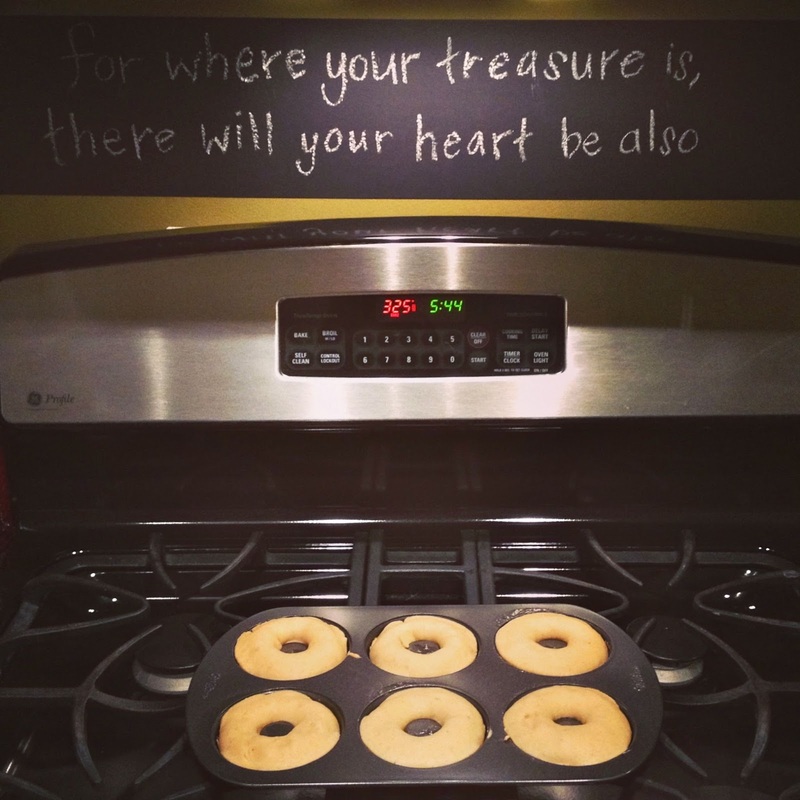 Fill your donut pan 3/4 full and bake for 8-10 minutes or until the donuts spring back when touched. Allow to cool slightly before removing from the pan. 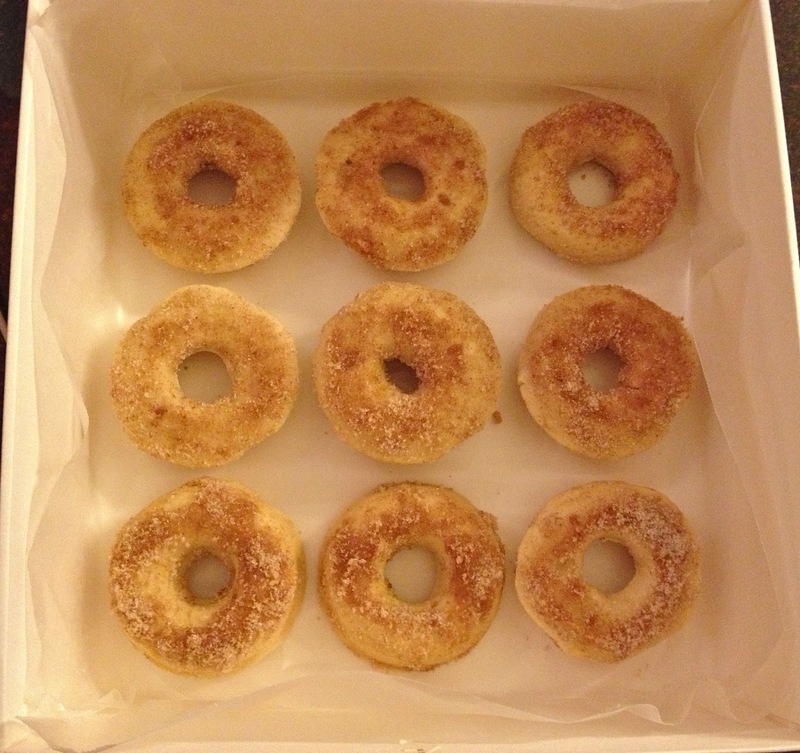 To make topping, mix together the sugars and cinnamon in a bowl wide enough to hold one donut. Dunk each donut quickly in melted butter to completely coat and place in bowl of the cinnamon sugar mixture to coat. *TIP 1: For easy transportation and nice presentation, find a clothes gift box, line with wax/parchment paper and place donuts neatly inside. If you need to add a layer, place wax/parchment paper between layers. *TIP 2: Donuts are best when served fresh out of the oven (hence why the clock on my oven says 5:44 am...*yawn*), but you can always just make these the night before and serve them the next morning if necessary.